The U.S. Treasury has published more statistics on how HAMP, the program supposedly to help people stay in their homes, is a dismal failure. The program has cost U.S. taxpayers $75 billion. 1.3 million homeowners enrolled in trials. 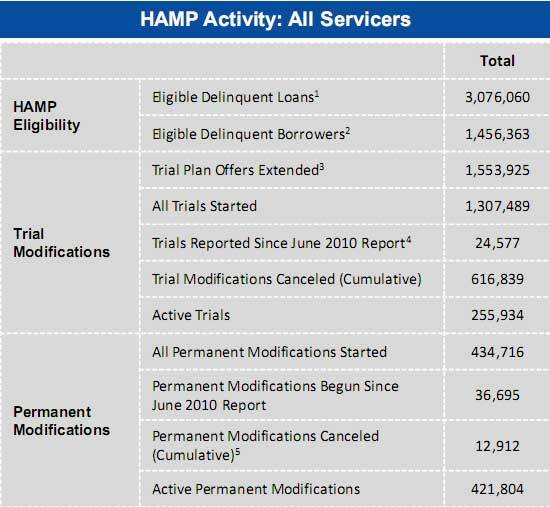 630,000 has been "cut loose" from the HAMP program. Approximately 630,000 people who had tried to get their monthly mortgage payments lowered through the government program have been cut loose through July, according to the Treasury report. That's about 48 percent of the those who had enrolled since March 2009. And it is up from more than 40 percent through June. Only 32% has obtained any mortgage payment reduction and are paying on time now. Foreclosures since 2007 are 2.3 million. For 2010, foreclosures are expected to hit over 1 million. Moody's Zandi projects foreclosures and short sales for 2011 will be 1.5 million. RealtyTrac reported that the number of U.S. homes lost to foreclosure surged in July to 92,858 properties, up 9 percent from June. The pace of repossessions has been increasing and the nation is now on track to having more than 1 million homes lost to foreclosure by the end of the year. That would eclipse the more than 900,000 homes repossessed in 2009, the firm says. Here is the HUD scorecard, but be warned, there is a lot of snow in this report, you have to read between the lines to see HAMP failed. Here is the U.S. Treasury report on HAMP. From July, 60.2% of people attempting to get their mortgages modified are doing so because they lost their income. Three states, California, Illinois and Florida have the most modifications, while Nevada and Florida have a delinquency rate over 20% of all mortgages. The more than 100 participating mortgage companies get taxpayer incentives to reduce payments. As of mid-June only $490 million had been spent out of a potential $75 billion the government has made available to help stem the wave of foreclosures. Isn't that interesting? Curious that less than half a billion out of $75 billion has gone to banks through tax incentives, but it is also reported HAMP has cost U.S. taxpayers $75 billion. Which is true, or is the rat maze of bureaucratic nightmare where people are lied to, their documents lost, 6 times in a row and other horror stories, that costly to create?